Oh preschool boys. I have one of them in my house right now and they are a lot of fun and can be super sweet and cuddly but they are also loud, messy, and a lot of work. 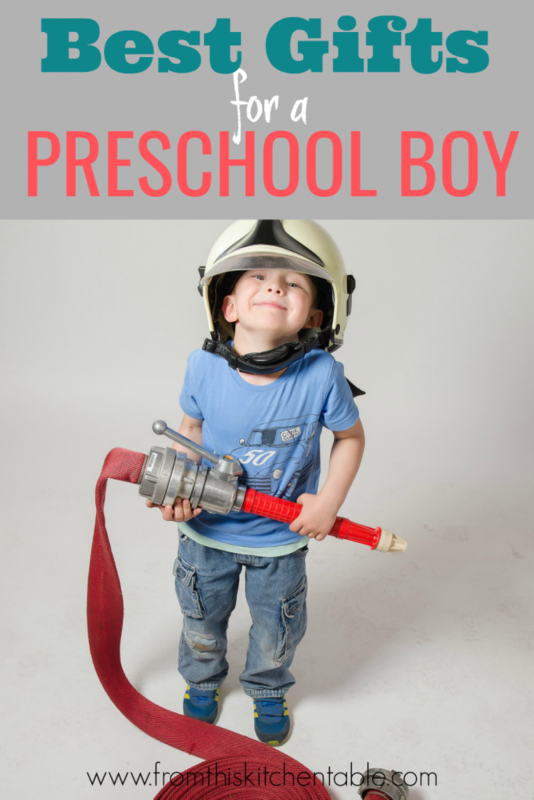 My preschool boy loves to explore and experiment – and in the process ruin things! 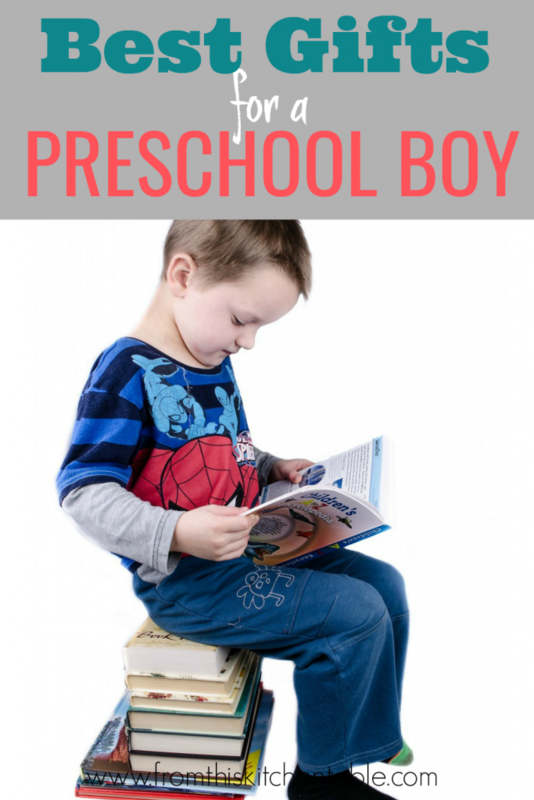 What are the best gifts for preschool a boy? These guys definitely keep moving, but given the right toys can sit down and work at a project for a long time. 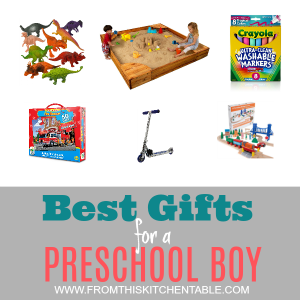 I’ve put together a list of the best gifts for a preschool boy – and all of them are ones my son LOVES! Scooting and biking he has a blast with but he’ll also sit down on the kitchen floor and put together puzzle after puzzle. At 4, my son has been scooting for several years now and can be quite the daredevil. I think learning to ride a scooter helped him learn to bike ride without training wheels easily too. Trains. Is there anything else to say. We have tracks at home and when we go to children museums he still goes right for the train table. My kids are obsessed with these creatures and we have quite the assortment of dinos at our house. They often make an appearance with the train tracks. We can spend hours watching trucks at a construction site and he loves taking his trucks into our yard and creating his own work site. I’m always surprised how much my preschooler loves puzzles – but he can sit there and do one after another. If it helps him go fast, my son is all over it. He’s always asking to ride bike. Books about their favorite subjects are always a hit. In our house that means books all about trains, trucks, and dinos with a few other favorites mixed in. The perfect thing to get creative with and practice drawing trains and dinos. If you are brave by some paint. It’s a little messy, but my 4 year old loves it. My guy also loves using a hammer and helping his dad with projects. This kit is similar to the projects that Lowe’s used to offer and he loved. Games with parents and siblings are a favorite. These are the ones that my son says are his favorite – and he really does pick them out the most frequently. Hiss is his number one pick. When they get going, my preschool boy can spend hours playing Duplos with his sister. 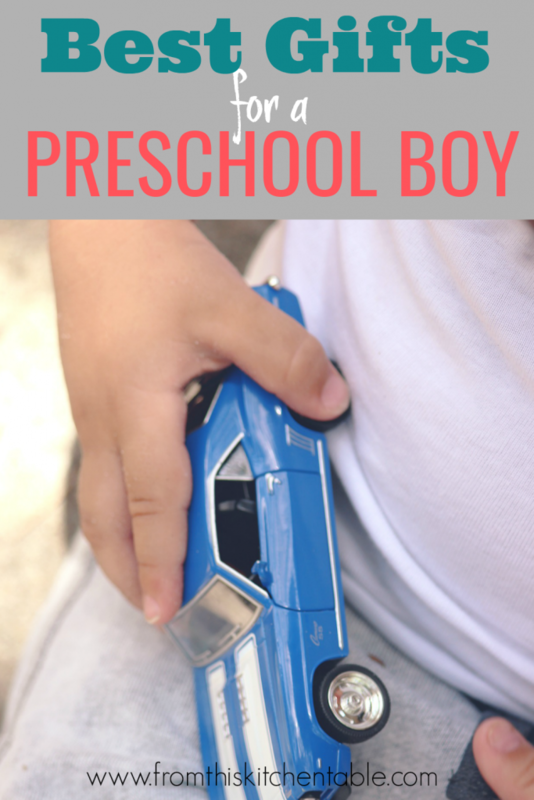 What are your ideas for best gifts for a preschool boy? Anything I should get for my son that he’ll love? 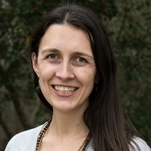 This entry was posted in Uncategorized on October 30, 2017 by Deanna Michaels.